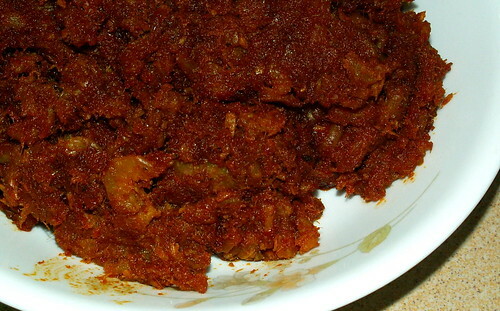 I already have a recipe for sambal hairbee in my other food blog. So, I shall not repeat the recipe again because I used almost the same things today. 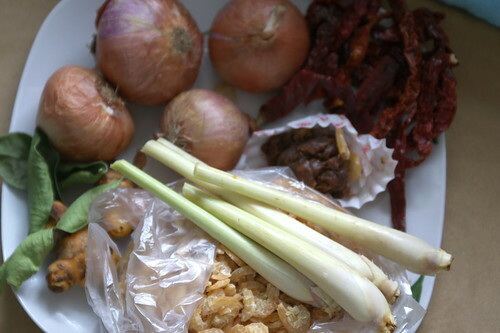 The ingredients are as above except for the belacan powder, sugar and some fish sauce. I bought 300 grams (8 taels) of local dried shrimps which costs RM12. This is the reason why you hardly can find any economy rice stalls selling sambal hairbee as a dish. Dried shrimps are expensive. What I did was to blend all the herbs etc with the tamarind juice (made with the pulp mixed with some water). I use a grinder to grind 70% of the dried shrimps till fine. You may use a mortar to pound them too. I intentionally left 30% of the shrimps intact because it is nice to chew on the shrimps. Remember to soak the dried shrimps till they aren’t no longer salty. The recipe yields a very huge portion but this can be kept in the freezer. I have separated my portion into four containers and these can be stored for a few weeks. I just need to heat it thoroughly in the microwave oven. If made with least tamarind, great when added into chicken flavoured instant noodles soup – kinda like prawn mee! 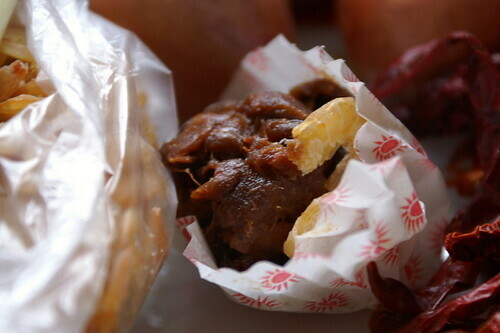 Sambal hairbee: I love sambal hairbee too. I like to pound mine. 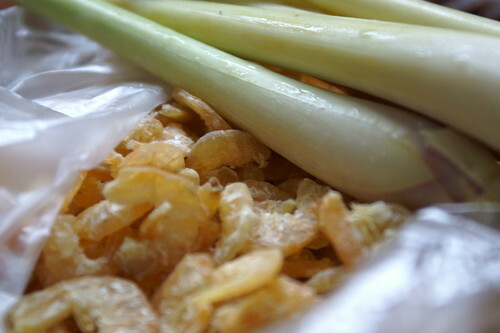 I squeeze some small lime(kik lah) after frying. Thanks 4 sharing all the wonderful recipe. Just discover yr blog and have been blogging ever since..